A cozy holiday home is located just 150 m away from the cable car station, a two minutes' walk! 5 rooms in different sizes (one with four beds, two with two beds, one with three beds and one single room), two bathrooms and a day-room with kitchen are available for our guests. On request, a hearty breakfast is served with products from an organic farm (subject to seasonal changes). Fine Swiss specialities and selected wines are served in the Alpine-style restaurant featuring a terrace with panoramic mountain views. 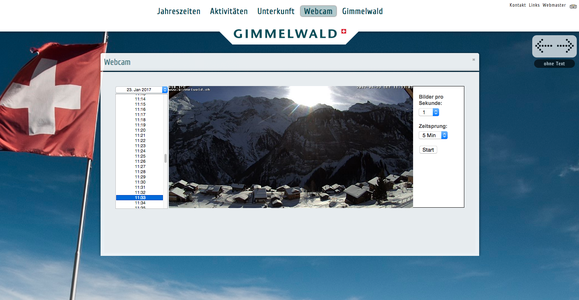 ...created and managed by Olle Eggimann, one of Gimmelwald's schoolteachers. An ocean of information about the village and surrounding areas, with many pictures of every season. The site has some excellent (detailed) hikes suggestions! The extension of the natural World Heritage property of Jungfrau-Aletsch-Bietschhorn. Brewed from scottish men and sold at the Mountain Hostel. The fixed rope route from Mürren down to Gimmelwald. The latest ultimate adrenalin kick! Rafting, canyoning, bungy, tandem paragliding, tandem hang gliding, tandem sky diving, mountain biking. Flying with Airtime is a first class experience for everyone. Enjoy the beauty of the Alps with an eagle view. A talented artist and frequent visitor to Gimmelwald, Andrea has painted a 360° panorama view from the hostel. The original is about 20 feet long. Guidebook author and travel TV host Rick Steves is America's most respected authority on European travel.